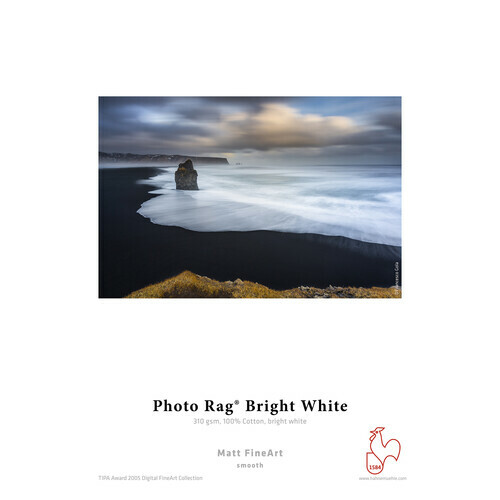 Hahnemuhle Photo Rag Bright White 17 x 22" Paper guarantees archival standards. The paper is compatible with both pigmented and dye inkjet systems and is ideal for photo and fine art reproduction, prints for presentations and exhibitions, limited edition prints, albums, and greeting cards. The paper is acid-free and highly water resistant. Box Dimensions (LxWxH) 22.2 x 17.4 x 0.8"
Photo Rag Bright White 17 x 22" Paper (310GSM, 25 Sheets) is rated 5.0 out of 5 by 1. Rated 5 out of 5 by E.H. Taguiam from As Always, Fantastic. I am a professional photographer in the gallery scene and this paper, by far is my favorite. It has a great weight and texture to it and the color depth is exceptional.